In partnership with Land & Sea Dept., Illinois Humanities presents the second volume of the second season of Elective Studies Supper Club for Illinois artists, featuring a lecture by mathematician Dr. Eugenia Cheng, a meal by chef Matt Sliwinski, and an opening drink by Land & Sea Dept. Beverage Director Paul McGee. This event is part of our Elective Studies series, created to help artists find inspiration from the world around them. Through a combination of lectures by top-tier experts and meals crafted by the city’s finest chefs, these convenings are designed to unite, inspire, nourish, and connect. With generous support from the Joyce Foundation, and sponsorship by Letherbee Distillers, Lagunitas Brewing Co., and Perrier. Mathematics can be tasty! It’s a way of thinking, and not just about numbers. Through unexpectedly connected examples from music, juggling, and baking, I will show that math can be made fun and intriguing for all, through hands-on activities, examples that everyone can relate to, and funny stories. I’ll present surprisingly high-level mathematics, including some advanced abstract algebra usually only seen by math majors and graduate students. There will be a distinct emphasis on edible examples. Dr. Eugenia Cheng is a mathematician and pianist. She is Scientist In Residence at the School of the Art Institute of Chicago and won tenure in Pure Mathematics at the University of Sheffield, UK. She is now Honorary Fellow at the University of Sheffield and Honorary Visiting Fellow at City University, London. She has previously taught at the universities of Cambridge, Chicago and Nice and holds a PhD in pure mathematics is from the University of Cambridge. Alongside her research in Category Theory and undergraduate teaching her aim is to rid the world of “math phobia”. 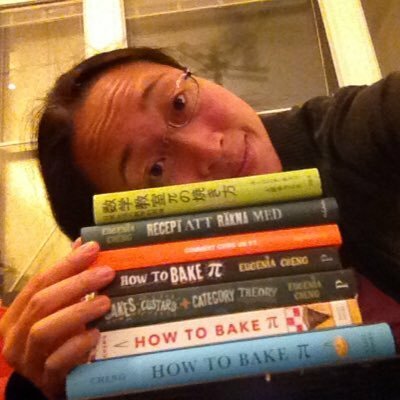 Dr. Cheng‘s first popular math book, How to Bake Pi, was published by Basic Books in 2015 to widespread acclaim including from the New York Times, National Geographic, Scientific American, and she was interviewed around the world including on the BBC, NPR and The Late Show with Stephen Colbert. The book has been translated into six languages so far. Eugenia was an early pioneer of math on YouTube and her videos have been viewed over a million times to date. She has also assisted with mathematics in elementary schools and high schools for 15 years. Her next popular math book on infinity will be published in 2017. Eugenia is also a concert pianist and runs the Liederstube, a Not For Profit organization in Chicago bringing classical music to a wider audience. Learn more about her at eugeniacheng.com and follow her on twitter. Matt Sliwinski is the Executive Chef of 16 On Center’s “The Promontory” in Hyde Park. Matt, also known as “Skittles,” is a Chicago native and graduate of Kendall College’s culinary program. He came to his current position through a tour of stations at the Michelin-rated Longman & Eagle. During his time at Longman, under the mentorship of Chef Jared Wentworth, Chef Sliwinski honed his craft by focusing on product integrity, source and sustainability. At 26, Matt left his Sous Chef position at Longman and Eagle to open The Promontory. The influence of Wentworth’s focus on product integrity, sourcing and sustainability is apparent in Sliwinski’s menu. The young chef is currently known for his seasonal menus, thoughtful execution, and approachable concepts while striving to be a community leader in Chicago’s South side. If you are interested in being added to the list of artists invited to these gatherings, please email electivestudies@ilhumanities.org.